This Catechism was written principally for Parochial and Sunday schools. Its subject matter is partly for the intermediate classes, partly for the higher classes and the Sunday school. Originally published by Benziger Brothers in 1900, this Catechism is unique as it is both advanced and intermediate. Younger students can omit the smaller type that is intended for advanced students. Texts Uaually Ignored by Bible Readers. 1950 edition “Published with Ecclesiastical Authority.” There is a conspicuous note on the third page that “Official Catholic teaching is the sum of Scripture and Tradition, divinely interpreted …” The text consists of 25 Questions on the History of the New Testament and their answers on pages 21-28. Hopefully this publication will correct misconceptions and answer objections of non-Catholics to see the true Church of Christ in a different light. 32 page pamphlet. Rev. John Laux, M.A. A complete history of the Catholic Church to the present day. Originally published by Benziger Brothers, Inc.
Imprimatur, 1930. 621 page book. Although there are several Church histories in English, some are too elementary to be satisfying to the adult lay reader, while others are too technical or voluminous. More especially, they do not present sufficient matter on the history of the Church in our own country, and they all lack the illustrative material which is so helpful and even necessary to the full understanding of the persons, events, and places read about. It is hoped that the copious illustrations and maps appearing in this volume will make it still more interesting to the reader, while the numerous excerpts from the writings of the Fathers, Doctors, documents of the Councils of the Church and of the Popes, etc., will make for better acquaintance with these interesting phases of Church History. A simple text-book of ceremonies for Altar Boys, with diagrams showing the movements and positions of the server and containing a pictured explanation of the vestments, altar and sanctuary appointments, together with an interlinear phonetic arrangement of the Latin prayers. It is a great privilege for a boy to be allowed to serve at the altar of the Most High God. The altar boy is indeed one of the pages at the Court of the King of Kings. How you should appreciate this high honor therefore by showing the greatest reverence in the sanctuary, by paying exact attention during the sacred services and by learning your part as perfectly as possible! It was in order to help you to do so, that this little book was prepared. 47 page booklet, Imprimatur, 1931. A Complete and Thorough Exposition of the Commandments of God and of the Church. With Numerous Examples From Holy Scripture, The Fathers, and Other Sources. With Reflection and a Practice on Each Commandment. Originally printed by Benziger Brothers in 1897. "Eternal salvation does not depend on faith alone, but also in keeping the Commandments. " This book is the most complete, the most thorough and the most enjoyable that I have ever read on this important subject. By Rev. C. Lattey, S.J. 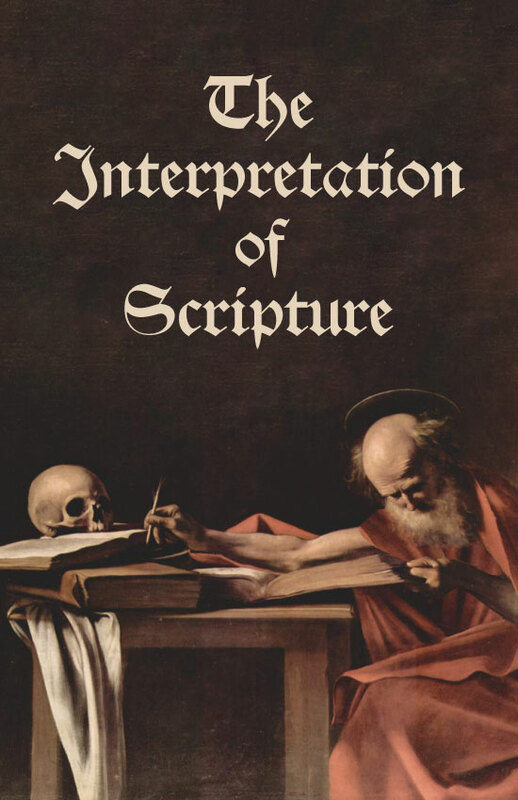 The object of this pamphlet is to explain both for the Catholic and the non-Catholic reader the principles and the practices of the Catholic interpretation of Scripture. The Catholic, while accepting the authority of Church and Bible, often has much to learn about their mutual relations, because there is so little upon this subject in the catechism. The text has been divided into parts and sections and numbered paragraphs, which makes it easy to follow and easy for reference. It is hoped that this pamphlet may promote a fuller understanding of the Holy Father’s words. Cover is slightly cracked along spine of booklet. Rest of booklet is fine no defects. By Rev. Gerald M. Paris, O.P. Being an Abridgement of the Questions of the Entire Summa Theologica of St. Thomas, Together with the Basic Reasons for Each of their Articles. “We have aimed to give the gist of the Summa to clergy and laymen, that this immortal work of St. Thomas may come to a wider and wider public, especially needful today, when truth is so much obscured. This book is very well indexed (12 pages) with an extensive table of contents (10 pages). This is a big book!